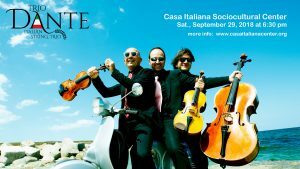 Trio Dante to Perform at Casa Italiana on Sept 29 | Ciao Washington! Founded in 1995, the Trio Dante (formerly Trio Lennon) is composed of renowned Italian soloists and performs a repertoire that ranges from classical and romantic with influences from the Vienna School to contemporary and American music including works composed for the Trio itself, passing thru the Beatles to arrive to the Italian soul with the music of the great Italian Opera composers. The trio members are recipients of high honors and awards and are winners of top prizes at international music competitions. They received favorable reviews from major newspapers and their music was featured on RAI Television and radio. They collaborate with internationally renowned soloists such as saxophonist Federico Mondelci, the tenor Giuseppe Sabbatini, guitarist Claudio Marcotulli, the mezzo-soprano Anna Maria Chiuri, and has also worked with musicians from different backgrounds including Avion Travel, La Cruz, and with Paolo Conte for the production of his album “Elegy”. As soloists or as ensemble the Trio members have appeared throughout Italy and Europe, Canada, Japan, Argentina, South Africa, Thailand, Oman, Egypt, Israel, Turkey and the United States where in 2014, 2016 and 2017 Trio Dante toured along the East Coast including performances in New York, Washington, Buffalo, Niagara Falls, Charlotte, Amarillo, New Haven, Annapolis and Salisbury. Roberto Molinelli, the violist, has been also very successful as composer. Many of his premieres were per- formed by some of the most important international symphonic orchestras at leading venues such as Carnegie Hall, New York, La Scala, Italy amongst other important venues. Whereas cellist Alessandro Culiani has received critical acclaim as music arranger and many of his arrangements have been performed in Italy, Japan, Argentina and South Africa and Russia, where the Moscow Chamber Orchestra featured his arrangements in Moscow’s famed Tchaikovsky Hall. Luca Marziali on violin, Roberto Molinelli on the viola and Alessandro Culiani, on the cello are the artists giving life and soul to this wonderful project. Roberto Molinelli has rearranged the immortal melodies of the Italian Opera’s “Belcanto”, readopting them into an original, suggestive and virtuoso chamber music dimension, but preserving their wide-ranging symphonic structure and the lyrical and expressive features that have made the original a lasting success. Tickets are only $10. Buy your tickets on the Casa Italiana web site.